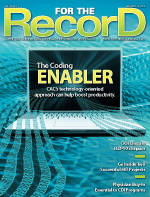 If used correctly, computer-assisted coding can help hospitals alleviate inefficiencies. As computer-assisted coding (CAC) is deployed by an increasing number of hospitals, its effect on coders is coming into focus. The evolution of workflow changes, productivity increases ahead of ICD-10, and fear of diminishing job prospects are all buzz-worthy topics. Bronnert says the effects of CAC implementation on hospital workflow may depend on how activities are structured and recommends facilities examine their processes. “Start with documentation,” she says. “How is it generated? Is it handwritten? How much is electronic? And what systems is it in?” This will help determine where productivity gains and efficiency improvement are most needed, Bronnert adds. Smith, president of Gail I. Smith Consulting in Cincinnati and an ICD-10-CM/PCS faculty trainer for AHIMA, believes CAC adoption will remove the rote work from coders’ plates. “That easy stuff that we waste our time on, the computer can assign it if it needs no human interaction,” she notes. And because coders will be freed from baseline coding tasks, they’ll be able to take on what Smith describes as more of an auditing role where strong decision-making skills will be essential. “It really forces the coder to work at a higher level,” she says. “You’re almost a detective in a way,” Smith says. “You have to be willing to challenge what the computer comes up with and, in some respects, investigate why it led down that path.” She believes having a user-level understanding of how the software works would be beneficial. “It’s another skill set for coders,” she notes. For hospitals whose documentation resides mostly in an electronic format, the adoption of CAC is likely to be less onerous, says Bronnert. “The CAC engines are designed to work with electronic documentation, so it’s a smoother initial process vs. if you have handwritten documentation that has to be scanned,” she says, adding that facilities able to avoid that extra step may gain greater efficiencies than those stuck with scanning handwritten material. Mark Morsch, vice president of technology at OptumInsight, says CAC works best when at least some of the information is available electronically. “Most facilities today have a hybrid record, where some data is paperless, some may be scanned, and some may still be on paper. The more information that can be made available digitally, the more you can take advantage of automated coding,” he says. By consolidating documentation into a single software platform, Morsch sees other benefits for coders. “Productivity gains from these new processes are helping hospitals now and will be imperative as we move to ICD-10 with an eightfold increase in codes,” he says. Coders are presented with codes assigned by the system, and those codes include highlights that link each code to the supporting evidence in the clinical documentation. Coders then review the CAC-generated codes and accept or correct them based on their expertise. “CAC transforms the role of the coder from the task of full coding to a reviewer or auditor of coding,” Morsch says. Some of those decisions to adopt CAC are a result of the looming ICD-10 deadline. “[Hospitals] are trying to counteract the loss of productivity with removing those rote coding decisions,” she says, adding that there will likely be spin-off roles or entirely new areas of responsibility generated on the back end, including “looking at reports and looking at trending as another double-check” while the technology and its use mature and become more widespread. “There are lessons to learn, and we don’t know what those are yet,” Smith says. Additional efficiencies generated by CAC adoption can be found elsewhere in the revenue cycle chain. Casto points to the technology’s ability to better “scrub” charts before they leave a facility as a way to reduce the number of disputed claims, citing one customer who experienced an 80% reduction in denials. “I think many of them have their eye on the future, which is ICD-10, and they know they’re going to have troubles there if they don’t get ready. But right now they can utilize the software to better prepare themselves and solve some immediate problems,” he says. Let’s get to what, for some, is the elephant in the room: Does the adoption of CAC mean that a hospital needs fewer coders? “Every hospital has its own productivity standards on what they expect,” Bronnert says. “From what I’ve heard from those hospitals for years now is that it’s not that they need fewer [coders].” Instead, Bronnert sees coders being used more effectively and at a higher skill level. “They become even more valuable to a facility. I don’t see their roles or positions diminishing at all. I see them flourishing,” she says. Smith says some early CAC adopters have reported demonstrable increases in productivity. “I think what’s going to happen is we’re going to need less entry-level coders, but we’ve been seeing that trend for years,” she says, adding that CAC will exacerbate the differences between new and experienced coders. Ryan doesn’t believe CAC reduces the number of coders a facility requires to stay on top of its workload. “CAC means they’re going to be able to cope with the changes in ICD-10, and clearly there are no fewer coders required if that’s the thinking you adopt,” he says. A third reason Ryan isn’t buying the idea that fewer coders will be needed with CAC is that existing coders may now finally have the time to make more use of their expertise and get involved in clinical documentation improvement. By implementing CAC, facilities may be able to work through backlogs, eliminate some outsourcing costs, and enable the existing workforce to be more productive. The software could also allow organizations to be better prepared for ICD-10 by affording them extra time for training. “A lot of them just don’t have that luxury right now,” Casto says. New to Coding? Listen Up. Smith doesn’t believe adding CAC principles to educational programs would be much of an adjustment. “We can very easily change our focus in education to giving students the codes and saying, ‘Is this wrong or is this right, and why?’ It’s not like you have to throw your curriculum away,” she says.